Last week on the Dog Sledding Examiner we profiled probably the most popular sled dog in history, Balto. There have been movies made about him and stories that every musher has heard countless times, but this week is the history of another great sled dog; Leonhard Seppala’s Togo. The story of Togo begins twenty-five years earlier when a Norwegian man named Leonhard Seppala came to Nome in 1900 from a fishing village north of the Arctic Circle. In Nome Leonhard entered the old ways of dog mushers and used this old Eskimo art to deliver mail and freight in the remote Alaskan wilderness. Leonhard began to specialize in Siberian Huskies. Smaller than the Alaskan dogs, they proved to be spirited pullers with the endurance to match and tough feet. In the years 1915 through 1917 Leonard and his teams of Siberian Huskies astonished the mushing world by winning the All Alaskan Sweepstakes race three years in a row. It was about this time that a skinny, mischievous pup named Togo worked himself into Leonhard’s life. Seppala tried to sell Togo twice as he doubted the pup’s potential. Each time Togo proved to be quite the escape artist and returned to Seppala’s kennels. At eight months of age Togo freed himself to chase after Seppala’s dog sled team, chase them up a trail and caught up to them easily. Seppala had to bring the young dog along if only to keep an eye on him. By the end of the day Togo had proven himself and had earned a place hooked next to the lead dog, a position he held for 75 miles. By the time of the diphtheria epidemic in 1925, Togo was twelve years old and had been Seppala’s lead dog for many years. In January of 1925, a diphtheria epidemic broke out in the isolated town of Nome, Alaska. There was a minimal amount of serum available, and the diphtheria outbreak showed no signs of lessening it grip on the town. Dr. Curtis Welsh, Nome physician radioed for help. In 1925 Alaska had no way to connect with the interior and the cold and weather would freeze airplane motors solid. The only way to get supplies from Anchorage to the town of Nome, (then about 1,700 population) was to ship the serum to Nenana, the last rail head in Alaska. The only way to get the precious, life saving serum to the interior was by an ancient mode of travel – dog power! Leonhard Seppala and all the dog team drivers stepped forward. They had the experience, the dogs were fit and ready and they did it to save the town. Little did they know that their efforts would capture the hearts and minds of a nation and earn national prominence for themselves and their teams. It was decided that the only fast way to make the six hundred and seventy-four mile run was by relay teams. Twenty top teams would be involved in the relay, including Eskimo and Athabascan Indian mushers as well as U.S. mail carriers. Leonhard Seppala and his team lead by Togo, would take the first sled out of Nenana. Once the shipment of serum arrived in Nenana, a musher named Wild Bill Shannon, grabbed the package, wrapped it in furs and he and his team of Malamutes made their way down the Tanana River. The temperature was 50 degrees below zero. Meanwhile, Nome’s best musher, Leonhard Seppala would travel eastward behind a string of his 20 Siberian Huskies, with Togo in the lead, to meet Wild Bill Shannon and the serum. Balto and a few other dogs were left behind at an outpost called Bluff to provide Seppala with fresh pullers on his return trip. Then Togo led the remaining dogs onto the treacherous ice of Norton Sound, driving for Unalakleet. After Seppala had covered 150 miles, 43 of which were jagged ice, he met Wild Bill Shannon and the serum. Seppala picked it up then spun around. By this time, a blizzard had struck and was pushing water onto the Norton Sound ice, causing it to break up into floes. The fastest way to Nome was back the way he had come — over Norton Sound. Sometimes Seppala could barely see Togo picking a path through the white mists, but he had to trust the dog’s judgment. In places, the route they had previously used had vanished. They glided within mere feet of frigid waves. Seppala gambled his life, the lives of his team and the fate of Nome, that Togo would lead them to safety. They made 43 miles after picking up the serum, rested and then, once more, moved on. By the time they reached Bluff and the relief dogs, Seppala and Togo had covered an amazing two hundred and sixty miles. The second-longest stretch in the relay effort was the final 55 miles from Bluff to Nome by Kaasen and the borrowed Balto. Even this was not easy going. There was an eighty-mile an hour blizzard with only Balto’s keen nose lowered to the ground to keep the scent of the trail and keep the precious cargo on track. The serum was delivered to Dr. Curtis Welsh’s doorstep at 5:30 a.m. – just 5 days traveling time and only seven days after it had left Nenana. The race for life had been won. The town of Nome would survive. Of the twenty mushers who rushed the serum from Nenana to Nome, 674 miles away, the man who drove the furthest in perilous conditions was Alaska’s great sled dog racer Leonhard Seppala. And the dog that led Seppala’s team on a loop of two hundred and sixty miles, including a long stretch over the fracturing ice of Norton Sound was the same dog with an impressive record of race victories over the previous decade — a small, feisty Siberian Husky named Togo, the real hero of the serum run. It wore Togo out and he was unable to race much after that. Years later, after adding to his string of race victories from Alaska to New England, and building a firm lineage of Siberian Huskies in America, Seppala retired to Seattle. 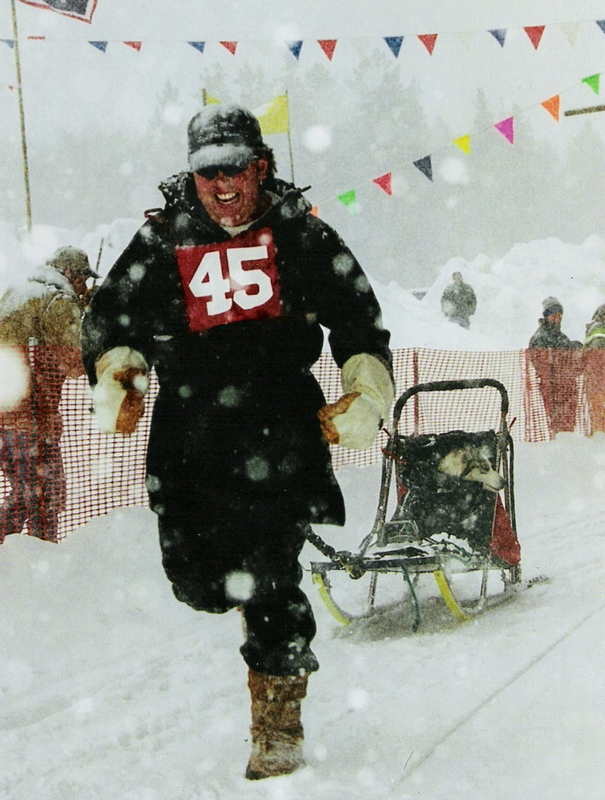 Leonard Seppala died in 1967, at the age of 90, and is buried in Nome, the original start of the Great Race of Mercy. In 1973 Nome became the starting point of the Iditarod Race. Togo’s legacy continues to spread. Compared to Balto, his fame may be slight but his progeny are legion. Many modern trainers of Siberian Huskies trace the lineage of their dogs back to Togo. There are no progeny of Balto due to the fact that he was neutered as a puppy. Today, the Iditarod Race is held in memory and honor of the Great Race of Mercy in January 1925. Together, without benefit of on-lookers or cameras, in dangerous weather and conditions, Seppala and Togo, earned their right to be called true heroes and raced their way into a history that has, until now, overlooked their part in it.